In Panama the dry season lasts from December to April and is a good time to visit for a birding trip. Resident birds are relatively easier to see then, in late winter many neotropical migrants havent flown north yet, some neotropical migrants are migrating through, and others from South America are breeding during the first half of the year. Its also prime time to escape cold weather in North America. With all this in mind, I arranged a guided tour to Panama for Adventure Travel Planners with Ancon Expeditions, essentially a private version of their Birds of Panama Program combined with a Harpy Eagle Extension. Our small group went birding and wildlifing all around Panama for two weeks, from February 22 to March 7, 2004. Panama is like the Idaho of Central America: a relatively undiscovered destination with interesting culture, history, friendly people and packed with tons of wildlife and birds. The southernmost country in Central America, Panama is a sideways-S-shaped nation slightly smaller than South Carolina and about 1/5 the size of California. At its narrowest point its only 50 miles wide, 50 along the strategically located Panama Canal, and about 100 miles wide at its widest point. It runs roughly east-west for a length of 500 miles, separating the Caribbean Sea and Pacific Ocean, and lies between Costa Rica on the western border and Colombia on the southeast. Three active tectonic plates meet within the region. In the geologic past, Panama was part of an archipelago, not fully emerging from the sea until 3 million years ago during the Pliocene Epoch. Hundreds of islands are scattered along both of its coasts. 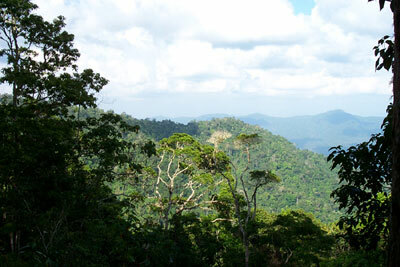 Extensive flat coastal lowlands cover 85% of the land, but Panamas temperate interior terrain is very mountainous. Its highest point is Volcan Baru at 11,408 feet, a dormant volcano surrounded by hot springs in the Western Highlands. There are over 500 rivers and more than half of Panama is still forested. Because of its unique location as a landbridge between two continents, Panama is both a mixing ground for land animals from North and South America and a funnel for birds that migrate over the land between them. Panama is part of the Mesoamerican Biological Corridor, one of the regions with the greatest biodiversity in the world. Although protection is not assured indefinitely, currently 29% of its territory is protected by 30 national parks and nature reserves. When the United States turned the Panama Canal over to Panama in 2000, it left behind a relatively intact watershed (of the Chagres River) necessary for the operation of the Canal and an engineering infrastructure that makes clean drinking water possible in the country today. Darién National Park is Panamas largest national park (1.4 million acres), and is one of the most remote, diverse and unexplored wilderness areas in tropical America. Both a World Heritage Site and Biosphere Reserve, it has beaches, rocky coasts, mangroves, freshwater marshes, palm forest swamps, mountains, dense tropical jungles and wild streams and rivers. Cana Field Station is located at its heart. Three Amerindian ethnic groups, Emberá, Wounaan and Kuna, over 400 bird species, including the Harpy Eagle, and animals like Bush Dog, Brown-headed Spider Monkey, Giant Anteater, Jaguar, Bairds Tapir and crocodiles all live within this legendary park. Darién National Park is a natural barrier and was established as a buffer zone to prevent hoof and mouth disease from entering Panama along the Pan-American Highway from Colombia, thus creating the Darién Gap and preserving the areas pristine ecosystems until today. But, because that disease was eradicated in Colombia, the highway to South America could be completed in the future. Venezuela has also proposed building an oil pipeline across northern South America to the Canal Zone. If any of that occurs, the same kind of environmental destruction that has taken place in northern Darién Province might happen here. Punta Patiño Natural Reserve has been farmed and partially logged, but is now owned by ANCON (Panamas largest nature conservation group, National Association for the Conservation of Nature) and is being reforested. At 75,000 acres this is Panamas largest private reserve. It has coast, beaches, mangroves, forests and mountains. 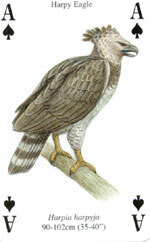 With biodiversity equal to that of Darién N.P., it also supports Harpy Eagles and an array of other wildlife. Corredor Biológico de la Serranía de Bagre, 75,000 acres, forms an important biological corridor between Punta Patiño Natural Reserve and Darién National Park. Panama boasts 960+ species of birds, the richest avifauna of any Central American country, about 220 mammals, 240 reptiles, 175 amphibians, 1,350 fish, countless insects and over 10,000 plants. Many of these are endemic species found nowhere else on earth and many are endangered. Some birds are shared only with Costa Rica (66) or Colombia (Choco) and 12 endemics exist only in Panama. About 60 Panama birds are only found in Darién province, and 150 are Neotropical migrants that only occur in the country from September to April. Panama is in the tropics and its climate is tropical maritime. It is hot, humid and cloudy, with a prolonged rainy season (mid-April to mid-December) and a short dry season (mid-December to mid-April). Temperatures are constant year round. Lowlands are hottest, ranging from 84° to 90° F, and nights are humid at 70° to 75° F. The Temperate Zone, from 3,280 to 6,560 feet (1,000 to 2,000 meters), is a few degrees cooler; nights are about 59°. Above this, the cold zone has mild daytime temps and freezing nights. Volcan Baru can also have freezing days. The dry season in Panama is relatively hot and drier than the rainy season, but rain can occur at any time. On our trip in February-March we experienced rain only once in the Western Highlands, and it didnt mist for very long. Even during the rainy season, rain typically lasts less than an hour on any given day in most of Panama, although the Caribbean side is twice as wet as the Pacific side. Panama is south of the hurricane zone. This trip was different than a fully independent one. I had a good idea for an itinerary, but the Ancon Expeditions staff expertly took care of all logistics within Panama for our group, including all domestic transportation, lodging, meals, guiding, trip extensions and extra hotel nights. Tents and bedding for camping were also supplied. All associated basic tour fees were included in one price. We only had to arrange international air transportation to/from Panama. Though the trip pace was quite commando, our Birds of Panama tour covered most of the birding highlights of Panama and a good variety of habitats, birds, mammals and culture. Associated with ANCON, Ancon Expeditions of Panama is a for-profit subsidiary company that helps make biologically rich areas owned by ANCON available to tourists. Ancon Expeditions manages several nature lodges in these national parks and reserves, including Cana Field Station and Punta Patiño in Darién Province, which are more easily visited with Ancon than on your own. 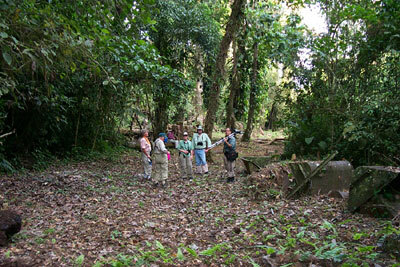 Known as the top nature tour company in Panama, Ancon Expeditions sets the standard for nature guides and tours there. Their birding tours are excellent and highly recommended. Book as early as possible to assure the trip and guide you prefer. When you book a trip, and when emailing Ancon Expeditions, please mention that "Elise sent you from the Panama Trip Report you saw on Surfbirds". info@anconexpeditions.com, www.anconexpeditions.com. Ivan Hoyos, our guide, is an enthusiastic birder, wildlifer and all around fun trip leader who comes with an Ancon guarantee! A world class birder with a keen ear and sharp eyes, hes a studious guide who is up to date on ornithological current events and has traveled and birded extensively beyond Panamas borders. He has a personal list of over 700 bird species in Panama alone. We really enjoyed being in the field birding and watching wildlife, learning about Panamas culture, visiting native Embará people and trying the desserts on the dinner menus with Ivan. We also met two other Ancon guides, Rich Cahill and Hernan Arauz. We birded a little with Rich, but not with Hernan. Local transportation we used included 3 charter airplanes and 2 domestic airline flights, which were usually late and sometimes scary, private vans and tour buses (always on time), pack horses, a tractor wagon, a boat, mountain bikes and the Panama Railroad, now a delightful tourist train. International airfares to/from Panama varied considerably, depending on when we checked them and our gateway cities. By arriving a day or two early and leaving later than the tour ended we were all able to find relatively cheap rates, ranging around $325 from LAX through Miami, cheaper directly from Miami. Some of our group went early enough for a partial transit of the Panama Canal, which only runs on certain Saturdays each month (check Ancons Day Tours, www.anconexpeditions.com). We minimized luggage because of a 25# limit on charter flights within Panama and to avoid checking anything for our international flight. We were allowed one small carry on daypack as our personal item and one medium duffel each. Getting through airport security was ridiculous. My husband Dave was searched for almost every flight, sometimes more than once. His large owling flashlight was seized as a "weapon" by TSA at LAX! Visit www.tsa.dot.gov to see whats allowable in luggage. A valid passport is needed to enter Panama, but the requirement for visas has been waived for many countries, including the US. Travelers from the US also need a tourist card youll get from your airline on your inbound flight and which requires a $5 fee when going through customs. Theres also supposed to be a $20 departure tax when you leave Panama, but we werent charged. As mentioned above, all lodging and meals were included while we were on tour. We stayed at seven places in five different areas. All were adequate, clean and comfortable, offering varying degrees of service, and for the most part really fun, and safe. Im more comfortable out in the rainforest jungles than in a big city, and I prefer rustic to luxury almost any time. Sometimes "suffering" for your wildlife is part of the fun. My favorite places to stay were Cana Field Station, Pirre Camp and Mogue Village, the most rustic of all and definitely highlights. We were given our own tents to sleep in at Pirre Camp and Mogue. I would have liked two nights at Pirre Camp instead of one. We spent our first and last tour nights, and extra nights, at the Hotel Executive in Panama City, a perfect place for office nuts like us. It offers internet access, office supplies, a complimentary full breakfast, a free happy hour, and a good backyard to bird in. Coincidentally we arrived at the beginning of Carnival, so there was non-stop partying in the streets during most of our stay in Panama City (PTY). 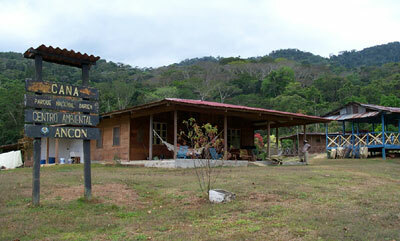 Cana Field Station is Ancon Expeditions bunkhouse-style lodge in the foothills of Darién National Park, at 1,600 feet in elevation. Set in the middle of what was once a large and active gold mining town (off and on since before the Spaniards arrived in the 1500s until the 1980s), its now surrounded by forests full of birds and animals, and little else. The only way to get there, unless you want to hike in for three days, is to fly in, birding along the way for raptors and macaws. You land on a grass airstrip cut from the jungle. The bunkhouse has partitioned rooms with fun addresses like Rufous Cuckoo, shared bathrooms, a place to do your laundry and a huge porch with hammocks that we all loved hanging around on and birding from. Meals are served family style on the porch of the cookhouse, where we enjoyed more birding. Punta Patiño Lodge in the Darién Lowlands was our headquarters for our Harpy Eagle segment. This lodge has a large veranda overlooking the Gulf of San Miguel, grassy grounds and primary tropical lowland dry forest habitat. We stayed in separate cabins with a/c and mosquito netting around each bed and ate meals in the main dining room. The lowlands were very hot and somewhat buggy, though rather birdy and full of mammalslots of monkeys, foxes and a Tayra were all visible right from our room decks or the dining lodge balcony. I always wanted to stay in a thatched roof tambo with a notched log "staircase" and the lodging highlight of our stay here was the new "Hotel" in Mogue Village where we went to look for the Harpy Eagle. Set in the middle of the village like a fishbowl, its a classic open-sided Embará tambo built on stilts with a large platform floor. We put our tents up on the floor and ate our meals at the table in the middle of the "room". Vampire Bats zinged all around the platform house at night, adding to the excitement. Dos Rios Hotel in the town of Volcan was similar to what you might find anywhere, and nothing remarkable. Service in its restaurant was iffy at best, but we enjoyed reading their menu and finding dishes like "Smached Potatoes". I agree with Bill Friars "amusement park" description of Gamboa Rainforest Resort. It was the most upscale place we stayednice soaps, bed turned down, flower on the sheet, etc.but its amenities were mostly wasted on our group because we were never "home" much while on tour. On our last day we had time to explore and bird. Had we known a night wildlife tour was included in our stay, we could have attended and looked harder for Capybara on our last night there. We learned they only cross the road at about 2:00 am. Meals were mostly simple and good, though not remarkable, but sometimes it seemed like all we did was eat like Hobbits, declaring second breakfast or second lunch! Many dinners included a delicious fish called corvina, often served with rice, and fried bananas or plantains. Besides various intriguing desserts like tres leches, we didnt find much other cuisine of particular note. Gamboa Resorts lodge restaurant had good buffets, but some of their other food wasnt very good, nor was their service. Local drinks include several varieties of beerPanama and Balboa are our favoritesand a national liqueur called Seco thats mixed with milk. There were usually good fresh fruits and fruit juices available at meals and it was usually safe to drink the water. Local coffees are good. We enjoyed sampling bird-friendly shade-grown coffee and buying some to take home to friends on our visit to Finca Hartmann in the Western Highlands. They also offered colorful burlap coffee sacks for sale. Panama Beer bottles and bottlecaps make interesting momentos too. Depending on which resource you consult, malaria, yellow fever and typhoid are or are not concerns to be considered in trip planning. We chose to take malaria prophylactics, get yellow fever shots and update our routine immunizations; we already had Hepatitis A shots. Other possible scary diseases include dengue fever and Chagass disease, for which there are no immunizations, and theres always the chance of encountering dangerous mammals or poisonous snakes, spiders, bees, wasps, scorpions or plants. To protect yourself in these cases, common sense should prevail. Travel insurance that covers trip interruption, lost luggage and medical evacuations is also a good idea. Generally, its always good to avoid being bitten by mosquitos, which can carry malaria and other diseases. For facts about bug vectors, diseases and prevention visit the CDC (Centers for Disease Control, Travelers Health) and IAMAT (International Association for Medical Assistance to Travelers) websites: www.cdc.gov, www.iamat.org. Bug Suits are usually too hot to wear in the tropics, but there are accessories and some new bug clothing available (see Equipment). We also brought repellent and sunblock, and used sulphur powder (about 16¢ a pack at the local farmacia) around our socks. The official currency is the Balboa, equivalent to one U.S. dollar, which is widely accepted everywhere in Panama. We minimized our luggage, so whatever we brought had to be as versatile and compact as possible. For example, we took space-saving high-tech nylon clothes that fold to nothing flat and wash out and dry overnight, and instead of a bulkier leather binocs case, I brought a neoprene Op/Tech Bino Soft Pouch for extra padding and protection, www.optechusa.com. We used JanSport daypacks for carry-on plane luggage and as overnight packs, www.jansport.com, and brought smaller fanny packs for hiking. The Kelty Falcon is the current version of my water bottle fanny, www.kelty.com. We also brought medium-sized Eagle Creek duffels, www.eaglecreek.com, and a tossaway duffel for storing a few items, like clean plane clothes, in PTY while on tour. Half our group used Bausch & Lomb Elite binoculars from Bushnell. We didnt know if our guides spotting scope would always be available, so we brought our own, a Bausch & Lomb Elite 70mm 20-60x with Rainguard. (Bausch & Lomb optics have all been rebranded as Bushnell and the Elite binocs redesigned). We also brought a waterproof Bushnell 2.5 x 42mm Night Vision Monocular for watching night critters. Bushnell sponsors ANCONs wildlife research projects that study Harpy Eagles and Jaguars in the Darién. www.bushnell.com. For our scope and photo ops we brought a compact Hakuba carbon fiber tripod with a Velbon magnesium ball head. These are no longer readily available, but new carbon fiber tripods from the same people who represented Velbon/Hakuba for the past 25 years are: One Source Network, www.osnusa.com. The new tripods have quick release legs, a feature previously impossible to find on carbon fiber models. With the head removed, these lightweight tripods fold down nicely to onboard luggage length. To easily cart our tripod and scope around we brought a convenient Tri-Pak from Wandering Tattler, wanderingtattler@lycnet.com, 800-231-9209. This lightweight triangular pack attaches to your tripod letting you carry it hands-free and use your binocs. We gave it to Ivan as a parting gift. He says, "It works wonders and has made my life in the field a whole lot easier!" We usually bring some old "one-way" clothes, but our standard "uniform" for birding and traveling is high-tech nylon shirts and zip-off pants from ExOfficio and Cabelas, www.exofficio.com, www.cabelas.com. (Cotton should be worn for safety when flyingin case of a fire in an accident it doesnt melt onto your skin like synthetics will). Long pants and long sleeved shirts are good on forested trails and in the sun, but legs can be unzipped and vented or sleeves rolled up and "locked" into place if it gets too hot. All of these clothes are comfortable, lightweight, breathable, moisture-wicking, antimicrobial, wash and dry quickly wrinkle-free and have sunblock SPF 30 built into the fabric. Besides all that, ExOfficios new Buzz Off Insect Repellent Apparel does an excellent job of warding off mosquitos, ticks, chiggers and other annoying bugs and insects. This clothing bonds man-made Permethrin (like natural repellent found in chrysanthemums) to garments in a special treatment process, putting it on clothes you wear, not on your skin. We were a little skeptical until we field tested some of these clothes. One day in Cana Dave forgot to wear his Buzz Off apparel. He bent his knees and was totally bit by mosquitos. I was wearing my Buzz Off convertible pants and shirt right next to him and I was fine. After that I no longer minded if I accidentally brushed up against vegetation, and could relax and enjoy the jungle more. I also liked wearing my Buzz Off crew shirt as a pj top in suspect sleeping quarters. Buzz Off apparel gave us peace of mind and freedom from bug bites. www.exofficio.com. Fortunately, we didnt encounter bugs very often in Panama, but we were ready for them. Contrary to what we expected, mesh doesnt breathe very well and most of the time it was too hot to wear very much extra, but other good Bug Suit components our group used included microfiber Gaiters and Elite Edition Bug Shirts from the Original Bug Shirt Company, www.bugshirt.com, mesh Bug Socks and an Ultimate Jacket and pants from Buzzoff Outdoor Wear, www.buzzoffoutdoorwear.com, and Northern Bugwears cotton/hemp Pullover Bug Shirt and pants, www.northernbugwear.com. I finally used my Bug~Out Outdoorwear, www.bug-out-outdoorwear.com, mesh Pullover Bug Suit and Mitts stuffed into their storage bag as my pillow at Mogue Village. All these Bug Suits were quite amusing to Ivan. You actually could take an entire trip with just one or two pairs of ExOfficios anti-bacterial, lightweight, breathable, moisture-wicking, speed-drying nylon underwear and socks. If you wanted. To take the chill off at higher elevations we wore fleece jackets or vests, and brought rain jackets for boat rides and in case of sudden showers, which never happened, www.thenorthface.com. A mesh bug jacket or shirt also works well as a lightweight windbreaker. A hat is essential in Panama, andOutdoor Research is known for its hats. Their dual-purpose crushable, sunproof (UPF 50) Sombreros, hats and caps are all great fun to wear. www.orgear.com. Sandals are on Ancons Equipment Checklist to bring to Panama and an excellent choice is Chacos Z/1 Performance Sandals with Vibram Terrano soles. Theyre sturdy and comfortable and feel exceptionally wonderful when you want to let your feet out at the end of a long hot tropical jungle day. And unlike velcroed straps on other sandals, Chaco buckled straps dont come undone by themselves. Besides sandals, Chaco also has durable, breathable leather hiking shoes and boots, like the Pitkin, a lowcut hiker. All of Chacos footwear is specially designed for fit and comfort. www.chaco.com. Chaco endemics! Rite in the Rain Notebooks and All-Weather Space Pens are standard items for all our birding trips. Even if it doesnt rain much, theyre durable, convenient and fun to use. There were so many birds and animals to see and keep track of in Panama that I almost filled up an entire standard size Rite in the Rain Spiral Notebook, plus 2 Mini Notebooks and was started on a 3rd when we left after only 2 weeks! Eliseo, the man who took us to the Harpy Eagle nest, liked the Mini Notebook I gave him for Riting about the Eagles in the Rain. The Notebooks come in many varieties, formats and sizes. The Pens write upside down, through water and over dirt, whether its cold or hot. The new black ink has an even smoother and better formula than before, and the black metal barrels are a lot tougher and stealthier than even the sturdy regular ones. Dont leave home without them! www.RiteintheRain.com. Chums eyewear retainers are also essential. They come in comfortable stretchy elastic and quick-drying materials and fun tropical colors. Chums Hat Clips make sure your favorite hat doesnt blow away in the wind, and Chumois Glass Cloths and Micro-fiber Bags help keep glasses and binocs clean. www.chums.com. Headlamps and flashlights came in handy when the generator went off at Cana and Mogue Village, and for spotlighting owls and animals on Pirre Mt. and at Gamboa. TSA at LAX kept our owling 4D MagLite, but we still had small flashlights and headlamps. For getting "around camp" one of my favorites is Black Diamonds tiny 2-LED Ion that looks like a green Tree Frog and runs on a 6V Lithium battery that lasts about 15 hours. But for walking or hiking the lightweight LED/halogen lamp on their Gemini is perfect, www.BlackDiamondEquipment.com. Other good small, but bright headlamps arePetzls 3-LED Tikka, www.petzl.com, Pelicans 2620 3-LED/Xenon HeadsUP Lite, www.pelican.com and Brownings 4-LED Odyssey, www.browning.com. The last 3 use garden variety AA or AAA batteries. Never shine your headlamp in anyones eyes, including your dogs. Ancon Expeditions website is a good place to start to find background information on Panamas logistics and birding, www.anconexpeditions.com. [For a mouth-watering description of birding at Cana Field Station, click here to check out Hernan Arauzs enticing write-up. Bird Life International, with plenty of links: http://www.bsc-eoc.org/links/links.jsp?page=l_cam_pa#spcount), and Panama Audubon Society: http://www.panamaaudubon.org/, although the last website doesnt always fully work. For information on Finca Hartmann go to http://www.angelfire.com/pa2/hartmann/ Look under Science, Lists for bird and mammal checklists, and under Maps for the Palo Verde area where we birded. Check http://www.arches.uga.edu/~bcooper/research/dr_appendix_a.htm for foraging guild information. Books we used for logistics and information about Panama in general include Lonely Planets Panama by Scott Doggett (2nd edition, 11/01; a new, 3rd addition, 4/05 is now available ) and Avalon Travels Adventures in Nature Panama by William Friar (1st edition, 2001). Bill Friar has so much more information about Panama that wouldnt fit in this book that hes writing a new guide to Panama for a different series from the same publishers. Titled Moon Handbooks: Panama, he promises it will be about three times as long as the first book and ridiculously comprehensive. It will be available in Fall 2005. www.lonelyplanet.com, www.travelmatters.com. In a welcome departure from what you often find in travel guidebooks that cover everything, these books have accurate wildlife and birding information. The maps in both LP Panama and Adventures in Nature Panama show good detail of the various areas we visited, but an excellent map of the entire country is International Travel Maps Panama Map. It shows topography with color-coded elevations (in meters), National Parks and other reserves, roads, cities, towns and airports, and has regional information discussions. www.itmb.com. To identify birds, besides taking advantage of Ivans expertise we used A Guide to the Birds of Panama with Costa Rica, Nicaragua and Honduras, Second Edition, by Robert Ridgely and John Gwynne, Jr. (1989). An "Unofficial" Addenda (2004), or update, for this book can be found online at http://www.geocities.com/xenornis/addenda.pdf. This is a list of newly reported species, confirmed hypotheticals and other notes of interest. A Guide to the Birds of Colombia, by Steven Hilty and William Brown, illustrated by Guy Tudor (1986), is another useful bird book, especially in the Darien. Because the Guide to the Birds of Panama is so unwieldy, we chopped the plates from the tome and refastened them together into a smaller booklet for easier use in the field. This can be done by hand or at commercial places like Kinkos. In addition, we brought the plates from A Guide to the Birds of Costa Rica by Gary Stiles, Alexander Skutch and Dana Gardner (1989). Since we were on a guided tour to areas we wanted to visit, we already had a good idea where to find birds, and Ivan helped fine tune the details and showed us the trails. But, another great, and accurate, reference for birds and wildlife in general and where to find them is Lonely Planets Watching Wildlife Central America (1st Edition, 9/02), by Luke Hunter and David Andrew. It covers habitats and parks in Belize, Costa Rica and Panama and includes a nice Wildlife Gallery. Another background reference is Lonely Planets Healthy Travel Central & South America (1st Edition, 2/00) by Isabelle Young. We also had a copy of LPs Latin American Spanish Phrasebook (3rd edition, March 1998), but didnt need it because most people we met spoke English and Ivan ran defense for us with the others. Panama still has a rich and wide variety of relatively easily accessible habitats ranging from intact marine ecosystems through lowland dry forests and rainforests to high altitude cloud forests. All are filled with a plethora of birds and other wildlife. This abundance is due in part to Panamas status as a land bridge: resident birds and animals are a mix from North and South America. South American birds are easier to find in eastern Panama (Choco-Darién Moist Forests) and Central American species are found west of the Canal (Talamancan and Isthmian Pacific Forests). Birds of central Panama, around Panama City and the Canal, include species from both sides. Habitats we visited include Pacific tropical dry deciduous forest, riparian/gallery zones, mudflats, coastal lowlands, mangroves, mature secondary premontane forest, intact primary montane rainforest, or, cloud forest, elfin forest, lagoons, ponds, grasslands, a bird-friendly shade grown coffee farm, a marina, a zoo and botanical gardens, forest lodge, urban hotel and airport grounds, roads (Pipeline, Achiote, Escobal) and just plain jungle. Panama birding is frequently brutal forest or "jungle" birding so at times its challenging to find or see birds. Theyre often in the canopy or thick understory, and flit around and hide. Tapes, if available, might lure out some reluctant skulkers like crakes or tapaculos. Lighting can be harsh on overcast days. Knowing vocalizations is a plus, but short-time visitors have little chance to learn them well. Birds with so many similar varieties (flycatchers, hummers, woodcreepers, antbirds, tanagers, etc!) are difficult to tell apart quickly. But, despite all these "hardships", birding in Panama is very rewarding and fun. Birds of every color combination seem possible, and colors are often brilliant or iridescent. Some birds look like patchworks of different shades, like the Bay-headed Tanager, or have every color imaginable, like the rainbow-colored Keel-billed Toucan. Others have distinct markings like the Sooty-capped Bush-Tanagers lightning bolt. Some are simply beautiful, like the Resplendent Quetzal. Our two-week Birds of Panama tour began and ended in Panama City, and covered many of Panamas birding hotspots. When we arrived and returned, we birded the backyard of the Executive Hotel. Our first official birding excursion was a day trip to Metropolitan Natural Park, followed by 4 days and nights in the eastern jungles of Darién National Park, including an overnight campout on Pirre Mountain. Next came our Harpy Eagle "Extension" to Punta Patiño and up the Mogue River to visit the Embará people (3 days). Afterwards we flew to David and birded in the western Chiriqui Highlands near Mt. Baru (3 days) and ended our tour in the Canal Zone (2 days). Cumulatively, our group saw a total of 352 species of birds (slightly more than 1/3 of those possible in Panama), 18 mammal species, plus Jaguar scratchings and Tapir tracks, 10 + reptiles, and countless intriguing insects, butterflies and plants. Mammals include both sloths (Brown-throated Three-toed, Hoffmanns Two-toed), Tamanduas, 5 kinds of monkeys, 2 squirrels, Gray and Crab-eating Foxes, a Crab-eating Raccoon family, White-nosed Coatimundi, Agoutis, bats and a Tayra. 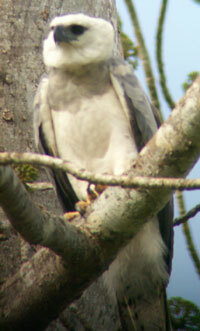 Most species were seen well by most of the group, and yes, we saw our Harpy Eagle! Note: In the following account, I mention new birds when theyre first seen in an area, but usually not each time theyre found. H = Heard, for when a bird was heard, but not seen. Orange-chinned Parakeet, Pale-vented Pigeon, Ruddy Ground-Dove, Rufous-tailed Hummingbird, Red-crowned Woodpecker, Tropical Kingbird, Great-crested, Social, White-ringed and Streaked flycatchers, Common Tody-Flycatcher, House Wren, Clay-colored Robin, Tropical Mockingbird, Plain-colored, Palm, Blue-gray and Crimson-backed Tanager (a South American bird), Streaked Saltator, Variable Seedeater, Gray-breasted Martin, Southern Rough-winged Swallow, and Neotropical migrant Tennessee and Yellow warblers. Our first official birding excursion on our tour was a day trip to 660 acre Metropolitan Natural Park, a tropical dry deciduous forest typical of the Pacific slope right in Panama City, and the Panama Viejo mudflats, also called Costa del Este. Metro Park has a bird list of 260 species, including Yellow-green Tyrannulet, a Panama endemic, and is known as an easy place to spot Geoffreys Tamarins and other wildlife. Our species total for the day was almost 100 birds, plus 4 mammals. As we piled out of the van at Metro Park, we quickly found the first of many animated birding guilds that were all along the way. We spent the hot morning birding the Mono Titi Trail (named after the tamarins) which ends atop a hill with a panoramic view of the city. Sightings on the way up (somewhat in order of appearance) included Blue-crowned Motmot, Cocoa and Olivaceous woodcreepers, Slaty-tailed Trogon, Northern Waterthrush, Great Kiskadee, Thick-billed Euphonia, Snowy-bellied Hummingbird, Red-legged Honeycreeper, Southern Beardless- and (H) Yellow-crowned tyrannulets, Plain-colored Tanager and a diurnal Central American Agouti. The shade along the trail down was most welcome! We saw many of the same birds again as on the way up, plus Long-billed Gnatwren, Yellow-crowned Euphonia, Rosy Thrush-Tanager (another specialty) and heard a Pheasant Cuckoo. Some other birds seen and heard: Ruddy Ground-Dove, Squirrel Cuckoo, Rufous-tailed Hummer, Western Long-tailed Hermit, Violaceous Trogon, a Plain Xenops foliage-gleaning, Western Slaty Antshrike, Dot-winged Antwren, Dusky Antbird, Yellow-bellied Elaenia, Dusky-capped Flycatcher, Masked Tityra, (H) Barred Antshrike, dustbathing Rufous-breasted Wrens, Black-bellied and Rufous-and-White wrens, Tropical Gnatcatcher, (H) Green Shrike-Vireo, Yellow-green Vireo, Golden-winged, Chestnut-sided, Black-and-White, Yellow and Bay-breasted warblers, Blue Dacnis, Red-throated Ant-Tanager, White-shouldered and Summer tanagers, Orange-billed Sparrow, Yellow-backed Oriole and an Osprey soaring over the city. Stopping at a bridge on the way to Panama Viejos mudflats we found shore and water birds in a creek: Wattled Jacana, Green and Little Blue herons, Yellow-crowned Night-Heron, Great and Snowy egrets, Blue-winged Teal, Purple Gallinule, Southern Lapwing, Short-billed Dowitcher, Spotted and Western sandpipers, Black-necked Stilts, Willet, Greater Yellowlegs, Laughing Gull, Amazon Kingfisher and a Yellow-headed Caracara perched atop a tree. At the mudflats the tide was beginning to come in. New trip birds included Great Blue Heron, White Ibis, Neotropical Cormorant, Semipalmated Plover, Least Sandpiper, Whimbrel, Marbled Godwit, Herring Gull, Royal and Sandwich terns. Magnificent Frigates and Brown Pelicans were flying around. This area is also known for Collared Plover and Cocoi Heron. After just a few hours (or even a few minutes!) at Ancon Expeditions Cana Field Station in Darién National Park its easy to see why Ivan wants to live here and Hernan calls it one of the top ten birding hotspots on the planet. Its a diamond in the rough and its first rate. The simple buildings are set in healthy, mature secondary premontane forest and the surrounding rainforest jungles are pristine and chock full of colorful birds and wildlifethe way Earth used to be. About 60 Panama bird species are found only in Darién; many others are more easily seen here than anywhere else. Some are Choco endemics shared with Colombia and a handful are endemic only to Panama. There really are four kinds of macaws along the airstrip. Its possible to see almost anything right from the porches, including Harpy Eagles, and Porch Birding is a favorite and productive pastime for tired travelers. Several old mining trails, now great wildlife trails, radiate out from the buildings, including the one that goes _ of the way up Pirre Mountain (5,330 feet). Some end up at interesting old mining equipment; each leads to a different set of animals and exceptional birds. The terrain is gradual along all the trails except Pirre. Our flight to Cana was uneventful, until the pilot covered the windshield of our DeHavilland Twin Otter planewe were flying into the sunand we hit a Turkey Vulture! The vulture was killed and a plane fender damaged, but luckily our landing gear remained intact and we landed safely. We were met on the airstrip by a small group of Cana staff and disembarked with no further problems. Besides the unfortunate TV, we also saw Black Vultures and White Hawks from the air. After settling into our rooms, we relaxed and started Bunkhouse Porch Birding. The first bird in Ivans scope was a Plumbeous Kite, and we studied some Ant-Lion circles on the ground. Flame-rumped Tanagers, Shiny Cowbirds, a Long-tailed Tyrant, a Black-cheeked Woodpecker, Prothonotary Warbler, Yellow-rumped Cacique and Smooth-billed Anis all put in appearances before we were summoned to lunch. Lunch birds from the Kitchen Porch included Masked Tityra, a flyover juvenile Ornate Hawk-Eagle, gurgling Chestnut-headed Oropendulas, whose nests are longer and more bulbous than those of caciques, large White-headed Wrens, Swallow Tanagers and the coveted Black-tipped Cotinga. Another days lunch birding produced Purple-throated Fruitcrows in their usual "crow tree" and Black-crowned Tityra. Back on the Bunkhouse Porch we continued to look at Chestnut-mandibled and Keel-billed toucans, Giant Cowbirds, a Grey-capped Flycatcher, Violet-crowned Woodnymph, Saphire-throated and Rufous-tailed hummers coming to flowering bushes, Variable Seedeaters, Blue-and-yellow Macaws (South American and our first macaws), a male Spot-crowned Barbet, Bat Falcon, Streaked Antwren and Buff-throated Saltator. We heard Paraques calling, Ruddy Pigeons and Mantled Howler Monkeys, which are about the same size as a human 4-year-old. After relaxing awhile we took an afternoon walk along the Airstrip where we tested our tick and chigger defenses. Wherever a large opening abuts forest creating an "edge effect" it makes for much easier birding than being inside the forest proper. We quickly found the rest of Canas Grand Slam of Macaws: Red-and-Green, heavy-bodied Chestnut-fronted (both South American birds) and Great Green macaws, as well as Mealy, Brown-hooded and Blue-headed parrots, Orange-chinned Parakeet, Collared Aracari, Great Black-Hawk, flyover Red-throated Caracaras (which are mysteriously disappearing), Squirrel Cuckoo, Black-chested Jay, Slaty Spinetail, Streaked Xenops, Pacific Streaked-Antwren, Tropical Kingbird, Social and Streaked flycatchers, a female One-colored and Cinnamon becards, Crimson-backed, Plain-colored and Dusky-faced tanagers and pumped up courting Giant Cowbirds. We heard Crested Guan and Slate-colored Grosbeak. At dusk we saw Crab-eating Foxes around the yard. Our "haul" for the day was more than 50 bird and 2 mammal species. Off the airstrip theres a short trail that leads along narrow gauge tracks to an interesting small old locomotive. We didnt find different birds here, but the locomotive is interesting and makes a good photo op. Next morning we took an early walk past the airstrip and into secondary premontane forest along the productive Boca de Cupe Trail, which eventually goes to the town of Boca de Cupe, three days hike from Cana. Specialties included snapping Golden-collared Manakins and Western Long-tailed Hermits on leks. The manakins sound like an electric shock as they snap. Off the bunkhouse porch we found White-tipped Dove whose call sounds like blowing across a bottle, Rufous-tailed and Blue-chested hummers, (H) Fulvous-bellied Antpitta, (H) Ruddy Pigeon, Bananaquit and Summer Tanager. Across the airstrip there was a flowering Erithrina tree with orange flowers and oropendula nests, Yellow-tailed Oriole, Smooth-billed Ani, (H) Great Antshrike, Chestnut-mandibled and Keel-billed toucans, Red-and-Green Macaws, and a "clover flower" mimosa, a low ground plant with leaves that curl up when touched. Ivan told us that in Panama all animals are "cats". On the trail into the forest, from a footbridge over a small creek we saw small clear "xray" fish with yellow stripes inside. New trip birds were often secretive skulkers and there were several groups of interesting birds: Golden-hooded Tanager, Sulfur-rumped Flycatcher, the Western Long-tailed Hermit lek, a female Bronze-tailed Plumeteer spreading her tail, Spotted Antbird, Great Jacamar, Slaty-winged Foliage-gleaner, Streak-headed and Plain Brown woodcreepers, a female Fasciated Antshrike, two small brown fuzzy bats with black legs, Turkey and King vultures soaring above and Baltimore Oriole. At one point we stopped and heard what sounded like raindrops, but were actually seeds falling down from the wind. We staked out the Golden-collared Manakin leks and eventually were rewarded with superb looks at courting males. Before turning back we found a tree full of White-thighed Swallows and saw Blue Morpho butterflies. Along the trail back to lunch we watched a Scaly-throated Leaftosser tossing leaves, a Common Potoo pretending to be a branch, ants on an Aphalondra tree with red flowers, White-shouldered Tanager, and Ivan glimpsed a fleeting Olivaceous Flatbill. He pointed out that the plate in the book (24-17) shouldnt show green on the face. This 1.2 mile loop trail leads past creeks and mining tunnels through the forest to old mining artifacts, and offers difficult but rewarding jungle birding. Crossing a small creek our first new bird was a scarce male Red-rumped Woodpecker. Next came Green and Little hermits, Slaty-winged and Buff-throated foliage-gleaners, (H) Thrush-like Mourner, (H) the anxious pygmy-owl sound of a Violaceous Trogon, a (H) Southern Bentbill, Yellow-bellied Elaenia, a Sulfur-rumped Flycatcher flycatching and returning to its perch, Tawny-faced Gnatwren, another Dusky-faced Tanager, various other Darién repeats and a black and white velvet wasp. On the way back someone spotted a small Black Snake near a creek and we heard a White-breasted Wood-Wren and a very rare Choco Toucan calling. Soon after, a suspicious-looking toucan flew directly over us. As dusk approached, we happily returned home accompanied by neon yellow fireflies. For our last stroll through the musical creepy forest at Cana Ivan chose to visit the productive Mine Trail again, which definitely did not disappoint. While lighting was harsh and birding as usual here was brutal, we found several more new birds, including a small group of foraging antbirds: Dusky and Spotted antbirds, Checker-throated Antwren and Black-faced Antthrush. We watched a pair of Olivaceous Piculets feeding each other and found a Darién Bay-breasted Wren before Ivan snagged a Tody Motmot in his scope, which was bigger than I thought it would be. He wouldnt let us look for long, because immediately after scoping the Motmot, a Green Manakin showed up. Then among colorful red and black fritillaries, small radioactive blue/black and other butterflies, there were a Lesser Greenlet, Wedge-billed Woodcreeper, Plain Xenops, a pair of Purple Honeycreepers and a male White-flanked Antwren. As we came back into the yard White-collared Swifts flew overhead. Our last day at Cana naturally began with more Porch and Yard Birding with Southern Rough-winged Swallows and Short-tailed Swifts overhead and a Piratic Flycatcher with its black "pirate" mask to name the new ones. First bird of the day, though, was a rare Spot-breasted Woodpecker, a fit prelude to the Seteganti Trail, sometimes called the Woodpecker Trail. There are plenty of woodpeckersRed-crowned, Black-cheeked, Cinnamon, Crimson-crested, Lineated, Crimson-bellied, Red-rumpedand we saw some of these, but also other possibilities on this short walk to the river through scrub and secondary forest, Dusky-backed Jacamar (Choco endemic), Red-billed Scythebill, Brown Violetear, Green Manakin (South American) included. We also scoped a perched Red-throated Caracara and admired its colorful beak, and saw MacGillivrays Warbler, Thick-billed Euphonia, Saphire-throated Hummer, a Clay-colored Robin and various repeats. Everyone present at Cana Field Station came on our overnight campout to Pirre Mt., including all staff, visitors and guides. Fortunately, this only meant 8 guests, 2 guides, our cooks, and packers with horses that carried our overnight gear and supplies. We put anything essential in our overnight packs (toothbrushes, a few clothes) and the horses and crew hauled everything ahead of us to set up camp. All we had to carry were small day or fanny packs with water and just birded and watched wildlife all the way up. Ivan carried his tripod and scope. This all made our 5 or 6 hour enduro transit easier. (5.5 miles). On the hike up Pirre Mt. you can feel the transition and see the boundary between mature secondary and intact primary premontane forest as you walk up into bigger trees spaced farther apart, and later, at about 3,000 feet, as you step into virgin pre-elfin cloud forest. The forests are musical: birds sing, call, gurgle and cry out along with different monkeys. The air is hot, but not too humid, except in small pockets you may walk into. Other than chiggers and ticks, there are few bugs (at least in February). There are specialty Woodpeckers, Panama endemics, and colorful butterflies abound. Possible Cassowaries, Bush Dogs, Jaguars and Bairds Tapirs, all signs of a healthy ecosystem, lure you up towards Pirre Camp. We began our hike after breakfast, finding a Tawny-faced Quail, a singing Black-striped Sparrow, perching Crested Guans and White-faced Capuchins, while passing paperbark trees (Molastomoatasia) in the secondary forest. Further along we heard, among many repeats, a Blue-crowned Manakin, Spider Monkeys, a whistling Dusky-capped Flycatcher and a Slaty-tailed Trogon, saw White-breasted Wood-Wren, White-ruffed Manakin, Bay-breasted and Blackburnian warblers (reynitas in Spanish) and watched a Long-tailed Hermit check a spiderweb. Near the boundary between secondary and primary forests, we found a Bairds Tapirs tracks that were as big as my hand, saw Jaguar scratch marks on a tree and observed a Red-tailed Squirrels tail. Moving up and along, a Purple-crowned Fairy zinged by, and we stopped to scope our first Panama endemic, an animated Stripe-cheeked Woodpecker, which has a "squishy toy" call. A black male Howler Monkey sat in the canopy overhead. Speckled Tanager, American Redstart, a male Golden-headed Manakin (South American), Rufous Piha, Slate-colored Grosbeak, (H) yet another Ruddy Pigeon, Ruddy-tailed Flycatcher (paler rufous than plate 25-1 shows), Sharpbill, Scarlet-thighed Dacnis, Bay-headed Tanager, Red-headed Barbets and Collared Trogon (South American) all enlivened our hike. Some huge blue leaves and a Brown-headed Spider Monkey with a baby in tow entertained us for awhile before we reached camp in mid-afternoon to the calls of Howlers, Black-striped Woodcreeper, Collared Forest-Falcon and Great Tinamou. Pirre Camp (4,200 feet) in the cloud forest was a welcome respite. Our screened tents were set up ready for us when we arrived. We threw off our packs, changed shoes, got drinks and made our way to the bench overlooking the valley and forest. In camp there was a Scale-crested Pygmy-Tyrant and a singing Gray-breasted Wood-Wren, along with Yellow-eared Toucanet, Chestnut-capped Brush-Finch, and our second Panama endemic, Pirre Bush-Tanager. It was somewhat surprising to find a Hepatic Tanager here. When darkness descended we owled from the bench, hearing a Vermiculated Screech-Owl (that sounded more like a screech-impediment-owl) and a Spectacled Owl. They were either down the mountain or invisible without crashing into the brush for a look. Waking next morning to the call of a Fasciated Antshrike, we watched a relatively large Purple-throated Woodstar flying in slow motion at a flowering Cephalis bush in camp before hiking further up into the elfin cloud forest on the Mountain Trail. This area is renowned for such treasures as Golden-headed Quetzal, Saffron-headed Parrot, Pirre Warbler, Green-naped Tanager, Beautiful Treerunner, Tooth-billed Hummer, Greenish Puffleg and dwarfed plants and trees. Other Pirre possibilities are Rufous-vented Ground Cuckoo, Orange-bellied Euphonia, Gray-and-gold Tanager, Gray-cheeked Nunlet, Sooty-headed Wren, Cinerous Becard, chlorophonias and antswarms attended by various antbirds. Before long we found a pair of Varied Solitaires, dull-colored birds with bright orange beaks. The female has a greenish wing patch. We didnt go very far up before the trail seemed to end, but we were intrigued with the different plants and animals: Cephalia hot lips (red and white columnar flowers), a big poisonous millipede with black and yellow feet, a pinkish medusa bromelaid that looked like a palm fruit and singing Ranas (frogs). We found Greenish Pufflegs, a Slate-throated Redstart fanning its tail, Dusky-faced, Speckled and Silver-throated tanagers, more Pirre Bush-Tanagers, a Swallow-tailed Kite flying by, heard woodpeckers tapping that sounded like Olivaceous Piculet wars and a Striped-throated Wren singing "Just leave it here." We got into an animated guild of foraging birds including Black-and-white and Blackburnian warblers, Red-faced Spinetail, Red-headed Barbet and Green-naped Tanager (Panama endemic) that were hard to follow because they kept moving so fast, followed by Pirre (Rufous-cheeked) Hummer. One of our cooks, Mario, an Embará from Boca de Cupe like the rest of Canas crew, cut some thin, but strong Cocobolo hiking sticks for our hike down the mountain. This tree is a favored carving wood among Embará. Mario also carves white tagua palm nuts into interesting animals like lizards and frogs that he offers for sale. Tagua nuts are a sustainable rainforest resource and make great souvenirs. Other than a False Fer-de-lance Snake and a Black-bellied Wren on the way down, we didnt find any other new birds or animals on our hike back to Cana. Well have to return for another look around! As the generator shuts off and lights go out, night descends on Cana like smooth black velvet. Night sounds seem to amplify. This is the way Earth used to be. May the Darién rainforests live intact forever. The Harpy Eagle is the national bird of Panama and, although its not the largest, is considered the most powerful bird of prey in the world. ANCON conducts a community monitoring project with local Embarás, so going to Punta Patiño and up the Mogue River offers a good chance of finding the "Ace of Spades". The people are immensely proud of their wildlife heritage, even naming their local basketball team Aguilas Arpias Mogue. We flew directly from Cana to Punta Patiño on the Gulf of San Miguel, landing on a short airstrip along the beach. It was hotter and buggier here in the Pacific lowlands. Upon arrival we and our gear were all loaded onto an awninged cart pulled by a tractor for a short ride up to the lodge. After settling into our rooms and changing into cooler clothes and sandals, we met in the dining area for lunch and birding. The first new birds were flying Mangrove Swallows and a Mangrove Black-Hawk off the lodge balcony. White Ibis and Wood Storks sat in trees in the distance while Magnificent Frigatebirds flew around them overhead. A Tayra, a large black weasel, sauntered along the road below the building and disappeared into the tall grass. In the afternoon we leisurely birded the grassy lodge grounds. Except for Yellow-crowned Euphonia, Gray-headed Chachalaca and another Piratic Flycatcher that was new for the day, we saw mostly repeat birds: Turkey Vulture, Smooth-billed Ani, (H) Rufous-breasted Wren, Streaked Flycatcher, Baltimore Oriole, Blue Dacnis (a tanager), (H) Pale-vented Pigeon, White-tipped Dove, Red-lored Amazon, Orange-chinned Parakeet, Blue-headed Parrot, Green Hermit, Rufous-tailed Hummer, Crowned Woodnymph and others. Plants included hot lips, palo santo, monkey ladder vine and jagua. We later learned an important use of jagua juice (see below). We found a poisonous Golden Orb Weaver Spider, heard a Grey Fox yelling and later saw them with their ticked tan coats. In the dining room at night there was a great Tree Frog and a Vampire Bat. The wetlands here were dry, so we didnt search for Capybara or go owling. Next morning, after watching Geoffroys Tamarins off our deck, we grabbed our overnight packs, sunscreen and hats, headed down to the beach with the crew and loaded into motorized dugout canoes for a boat trip around Punta Alegre and up the Mogue River to look for Harpy Eagles. On the way to the beach we found a Wood Stork, Great Blue Heron, Collared Aracari and another Mangrove Black-Hawk. Heading out to sea and rounding the Point we were amazed to encounter massive kettles of Turkey Vultures swarming above us as far as the eye could see. There must have been thousands of them, the most wed ever seen, perhaps a good proportion of existing TVs. Next we saw a giant teeming flock of unidentifiable shorebirds flying next to shore. Impressive. There were also Magnificent Frigate, Brown Pelican, White Ibis, Little Blue Heron, Whimbrel and Willet. Passing the beach at the town of Punta Alegre near the mouth of the Mogue River, we enjoyed seeing fishing pangas with names like "George of the Jungle." The tide was low and submerged log debris in the river was hazardous. Motoring slowly upriver past red mangroves, with black and button mangroves further back, we saw Neotropical Cormorant, Osprey, Swallow-tailed Kite, Mangrove Black-Hawk, Spotted Sandpiper, Green Heron and Snowy Egret before stopping to admire a family of five Crab-eating Raccoons hanging out in a mangrove tree. The mother had four young, tattered ears, small feet and no mask; the young had masks. Next we found a Rufescent Tiger-Heron stalking through the undergrowth (South American), Green Kingfisher, Black Vulture, Mangrove Yellow Warbler and a radioactive Blue Morpho butterfly. Arriving at Mogue we were welcomed and led through the village past the local snack stand to the thatch roofed tambo "hotel" with the notched log staircase where we took a break and got ready to hike to the Harpys nest tree about two hours away. Eliseo was our guide through the hot primary tropical lowland dry forest. After crossing the river, which was shallow and narrow near the village, we headed up the trail past some houses and found a female Three-toed Sloth, a sombra, with her baby, Geoffroys Tamarins, heavy guava wood, large Cocobolo trees, Squirrel Cuckoo and Purple-throated Fruitcrows, but since it was mid-day, few other birds. Along the way we kept hearing large trees blowing over, and wondered why, since logging wasnt happening. Apparently it was from the light breeze and we were glad we werent right next to them whatever the reason. After hiking an hour or two we came to an area with a large Cuipo tree that Eliseo said was the Harpy Eagles nest tree. We settled down to watch as he began whistling to call one in. Just enough time elapsed to create a feeling of suspense. Within a few minutes a large white hawk-like bird flew in and landed near the nest. It shifted branches a couple of times. In a second, the breeze kicked up its diagnostic double crest feathers. 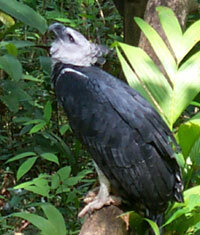 It was a juvenile Harpy Eagle. Even though it could hunt for itself, it called to its parents. We savored and scoped it to our hearts content. It was mostly white with a grey chestband, grey and black wings, dark piercing eyes and eyeshine. Its tongue and gape were pink. It had a porcupine quill stuck on its face near its mouth, a possible learning curve artifact. Near the Eagle there were fleeting Blue Ground-Doves and a female Blue Cotinga. Along the thirsty hike back I lost my Cocobolo hiking stick from Pirre Mt. when we stopped to view our first Orange-crowned Orioles, and the others left their sticks behind too. Further along we spotted our only White-vented Plumeteer, and just before the river large Crimson-crested Woodpeckers whose heads were brilliantly red in the afternoon sun. Like Pale-billed Woodpeckers, their white back stripes converge in a V, unlike Lineateds which are parallel. After our celebrations and meeting the village Jefe that night Ivan asked us if wed like to be tattooed. If so the ladies would mix up their paints for tomorrow. So as not to miss out, we cautiously consented. They showed up next morning with their jagua juice paints and proceeded to "tattoo" all of us in their traditional motifs. Though a little smeary at first, the paints dried into delightful patterns, but werent permanent. It was actually rather disappointing when they began wearing off after about a week! Next the ladies set their crafts out for us to shop. They offered red Cocobolo carvings of eagles, turtles, sloths and other animals, colorful baskets and woven decorative plates adorned with animals, birds and insects, painted tagua nut carvings and shell and boars tooth necklaces. Then for awhile we enjoyed playing and talking with the village kids before they accompanied us back to the boats. The tide was up so the trip down the river was fast. We took an afternoon walk down along the road and found two new South American birds, Rusty-margined Flycatcher and Greater Ani, along with Collared Forest-Falcon, Red-lored Amazon, Crested Oropendula, Blue-black Grassquit, Shining Honeycreeper, many other birds and a Grey Fox. Early next morning we took a "Coffee Walk" to a nearby hill, finding Southern Beardless Tyrannulet, Red-crowned and Crimson-crested woodpeckers, Orchard and Orange-crowned orioles, Scaly-breasted Hummer, Keel-billed Toucan and (H) Striped Cuckoo, to name a few. The crew met us with hot coffee and rolls for First Breakfast. After Second Breakfast we headed over to the Piedra Candela Trail through the lowland dry forest, Spanish for "Candle Stone", literally flint. When struck, the grey stones found here make sparks! There were Geoffroys Tamarins, a visual Southern Bentbill, small neon-mouthed and bark-colored lizards, a female Black-tailed Trogon, Atu leaf-cutter ants near a giant ant city, a calling male Jet Antbird, monkey ladder vines, yellow and brown orchids on a tree, (H) Lance-tailed Manakin, various colorful butterflies, Panama Flycatcher, several other flycatchers, Southern Rough-winged Swallow, (H) Roadside Hawk, Gray-headed Tanager and a Poison Dart Frog. We flew back to PTY via private charter and then to David in Western Panama on a commercial plane. At the David airport we watched a flock of Brown-throated Parakeets wing by before boarding our tour bus and heading to Volcan near Mt. Beru and Dos Rios Hotel with its baby coffees, tres leches cake and smached potatoes. Many birds here are shared with Costa Rica and the elevation gives a different feel to the birding experience. This area is cooler than Dariéns lowlands, and a fleece jacket is comfortable, but we only needed rain jackets once during a short mist. In the morning, as Blue-and-white Swallows flew overhead, we drove out of Volcan and up to Finca Fernandez, a farm and lodge on the edge of Volcan Baru National Park and near La Amistad International Park, where Juan Fernandez joined us. In his front yard we quickly found a tree hiding a pair of Resplendent Quetzals, a Red Squirrel and an Emerald Toucanet, a "hummingbird bush" that attracted White-throated Mountain-gems (males have brilliant turquoise blue heads), Volcano and Magnificent hummers and a Slaty Flowerpiercer. We continued walking up the road that started in farmlands and went into cloud forest, first spotting Black Guans, indicating a healthy ecosystem. Other birds along the way included Black-faced Solitaire, House Wren, (H) a possible Swainsons, Mountain and Clay-colored thrushes (robins), Long-tailed Silky-Flycatcher, several repeat tanagers, Mountain Elaenia, Wilsons, Black-cheeked, Black-throated Green and Flame-throated warblers, Collared Redstart, Ruddy Treerunner, Yellow-winged Vireo, a wheezy Ochraceous Wren, Spot-crowned Woodcreeper, another White-throated Mountain-gem, Sooty-capped Bush-Tanager with its "Harry Potter" lightning bolt face pattern, Yellow-bellied Sisken, Rufous-browed Peppershrike, Rufous-collared Sparrow, Yellow-throated Brush-Finch, Black-billed, Orange-billed and Ruddy-capped nightingale-Thrushes, Large-footed ("Frodo") and Yellow-thighed finches, and (H) and glimpsed a male Silvery-fronted Tapaculo that, like the (H) Wrenthrush, just did not want to come out of the woodwork. On our way back we stopped to wait out a Fiery-throated Hummer that kept returning to a perch in a favored bush, saw a female Collared Trogon, a "swarm" of White-collared Swifts and (H) an Acorn ("Tree Penguin") Woodpecker near the southernmost part of its range where there are no true acorns. Back at Dos Rios for lunch we noticed a "Guitar Bird", a Black Phoebe sitting on a guitar decoration on an outside wall at the restaurant. In the afternoon we visited nearby Volcan Lagunas, Panamas highest marsh ecosystem, at about 3,960 feet, to check for possible Masked Ducks and other waterfowl. On the way we could see imposing Mt. Beru which had come out of the clouds. In the woods around the lakes we saw Chestnut-sided Warbler, Buff-throated Saltator, Baltimore Oriole, Boat-billed Flycatcher, Tropical Parula, a male Collared Trogon, Masked Tityra, (H) Dusky-capped Flycatcher and (H) Flame-colored Tanager. The lakes yielded Cattle and Snowy egrets, American Coot, Common Moorhen, Pied-billed Grebes and Northern Jacanas, but alas, no Masked Ducks. Rose-throated Becard is another possibility here. Early the following morning we drove west through the mountains towards Santa Clara to visit a bird friendly shade grown coffee farm and lodge in the western cloud forest, birding all the way. Roadside Hawks, a Cattle Egret roost tree, Bat Falcons and White-faced Capuchins greeted us. Yellow-headed Caracaras and Double-toothed Kites follow these monkeys around for insects, but none were present that day. Finca Hartmann is a delightful respite with friendly hosts, tasty coffee and good birding, and 282+ species are possible along its roads and trails through remnant cloud forest and coffee trees. Sr. Ratibor Hartmann also has an interesting insect collection that includes a new species of coppery beetle he found on the other side of Mt. Beru. After our hike around the Palo Verde area of the farm, we were treated to cold juice and hot coffee samples, and bought coffee beans and burlap Finca Hartmann coffee bags for decorations. http://www.angelfire.com/pa2/hartmann/. Upon our arrival at the coffee farm a Blue-crowned Motmot, Cherries Scarlet-rumped Tanager, a blue male Scarlet-thighed Dacnis, a comical House Wren, Philadelphia Vireo, a large Violet Sabrewing, Red-crowned Woodpecker and Golden-hooded Tanagers were some of the birds that quickly caught our attention in the yard. Heading up the road we found Turquoise Cotinga, Bay-headed Tanager, Blue-hooded and Thick-billed euphonias, Swallow-tailed Kite, an odd looking Black-throated Green Warbler, Yellow-green and Yellow-throated vireos, Yellow-faced Grassquit (the "X bird" for the yellow x on its face), Boat-billed Flycatcher, Rufous-collared and Black-striped sparrows, Buff-throated Saltator, Pale-billed Woodpecker with yellow underwings, a Short-tailed Hawk on a nest, Piratic Flycatcher and White-tipped Dove. Our hike started out cool, but out in the open quickly became hot. Along the creek trail back there were Black-hooded Antshrike (a new Panama bird for Ivan), Paltry Tyrannulet, a flock of Indigo Buntings, and various other flycatchers, tanagers and migrating warblers. We stopped briefly on our way back to the airport to bird Tapir Canyon, a river gorge, but had we known our plane would be so late, we might have stayed longer! We found our first Green and more Red-legged honeycreepers, White-throated Thrush (Robin), Crested Oropendula, White-ruffed and Blue-crowned manakins, American Dipper, Black Vulture and Black-chested Jays that acted like our North American magpies. At the airport we learned our plane would be late, so as we watched Fork-tailed Flycatchers in the parking lot, we got the signal to load up into our bus, with Rich Cahills group, for a visit to a bar and grill at nearby Pedregals marina. As we enjoyed Balboa beers in frosty glasses, French fries and fried yucca (delivery systems for ketchup), we watched Royal Terns, Magnificent Frigates, Brown Pelicans, Laughing Gulls, a Ringed Kingfisher, Social Flycatcher, Clay-colored Robins, Great-tailed Grackle, Gray-breasted Martins and a black Tan Iguana. Back at the airport, the plane was still late. Taking our last chance to bird here, we went out for a walk around the airport park, where families like to stroll. We saw Eastern Meadowlarks, Red-lored Parrots, Brown-throated Parakeets and the western corvina race of Variable Seedeater. As we were trying to call the Seedeaters back out, a pair of young Striped Owls perching nearby answered! As Bats flew over at dusk, we returned to the terminal to get the other birders and a flashlight before the plane arrived. We got back to PTY after dark and drove to Gamboa Rainforest Resort where we stayed in comfortable villa apartments formerly used as canal workers and soldiers quarters. They were decorated with pictures from the old canal days. Next morning at 0-dark-thirty we loaded up again for a wildlife trip to the jungles of the Caribbean lowlands. From Gamboa we drove north along Gatun Lake, one of the largest manmade lakes in the world, crossed Gatun Locks without a wait and headed up Escobal Road to Achiote Road. The air was hot, but wildlife that morning was abundant and animated and birds were plentiful. We stopped first at a large grassy field where we quickly found Red-breasted Blackbirds, Keel-billed Toucans and a Yellow-headed Caracara. Further along the road through the jungle we hit a wildlife jackpot. Blue Morphos flew around us as we watched Yellow-backed Orioles and a black Mantled Howler Monkey with a baby, White-faced Capuchins, a Three-toed Parisoso (Sloth), listened to more howlers and a singing wren, saw a Coatimundi, Geoffroys Tamarins and our first Tamandua (Anteater), followed by a perching Black-breasted Puffbird! Along Achiote Road in the San Lorenzo Protected Area we found Lesser (Thick-billed) Seed-Finches, Ringed Kingfisher and various flycatchers before parking the van and walking up the road. Here we watched five Collared Aracaris eating various fruits, Palm Tanagers, a Lineated Woodpecker, a Plumbeous Kite winging overhead, Lesser Goldfinch, pairs of Barred Antshrikes and Yellow-bellied Seedeaters, a Purple-crowned Fairy with its distinct silhouette, and Ruddy Ground-Doves, among other birds. A road kill Possum soon attracted Black Vultures that picked at and ate it and eventually stretched it all over the road, like Serengeti Lions on a kill. Somewhere along Achiote Road we went to a place called Annato to hunt for Montezuma Oropendulas and found Bronzed Cowbird and Thick-billed Euphonias instead. Backtracking, we stopped at the Gatun Dam Spillway Park to look at a smiling Two-Toed Sloth hanging out in a tree and slowly eating leaves. This sloth has three claws on its back feet, but only two on its front, while the Three-toed is smaller and has three claws on each foot. This one caused smiles and exclamations each time it moved, and we savored the shade as we watched and photographed it. Venturing over to look at the spillway, which was closed and not letting out much water, we found Tricolored and Little Blue herons, finally an Anhinga, Southern Lapwing, Least and Western sandpipers on the mud, a possible Purple Martin, Tropical Mockers, a Palm Warbler and scoped a Yellow-headed Caracara perched in a tree. Driving through the former U.S. military base of Ft. Sherman (which was once used for jungle warfare training, contains live ordinance and is for sale), we arrived at the imposing 16th century Ft. San Lorenzo (in the Protected Area) that sits atop high bluffs at the mouth of the Chagres River. Now a World Heritage site, the fort was constructed to help guard stolen Inca gold from pirates in the Caribbean! * Goods from ships sailing the Pacific from South America were transported overland across the isthmus along the Las Cruces Trail and loaded onto Spanish galleons. The fort is constructed of large chunks of cut coral and is rather interesting to walk through. Its walls also make a nice perch from which to eat lunch and watch birds. Besides others, we watched Barn Swallows winging around, a male Blue-chested Hummer coming to a flowering tree and Orange-crowned Parakeets eating balsa tree sausages, all at eye level. For a virtual tour of the fort visit www.sanlorenzo.org.pa. We had to wait a short while on our way back over Gatun Locks for some Panamex container ships, the largest ships wed ever seen, to complete their transit through the locks. These ships were specially built to just the right specs to allow them to fit through the canal with about two feet to spare on either side. The wait also afforded us a chance to observe the mules in action, the small railroad cars that help guide ships through the channels, and to admire the world-renowned engineering feat of the Panama Canal. Fortunately we still had time to spare before our train ride, and could visit Ivans Night Monkey Stakeout. Ivan has a nearby stakeout for Western Night Monkeys near Colón. As luck would have it, they were in their roost tree when we visited and looked out at us with large wide eyes from inside a cavity in the trunk. The tree is off the back deck of a disco, an appropriate spot for these particular monkeys! A brief perusal of the rest of the trees produced a Passerinis Scarlet-rumped Tanager and a Cocoa Woodcreeper. The Panama Railroad was originally built between 1850 and 1855 to accommodate people from the East Coast going to the California gold rush who thought it easier to sail the Atlantic to Panama, cross the isthmus and board another ship in the Pacific to get there rather than crossing North America through hostile Indian territories. Its the worlds first official transcontinental railway. It had fallen into disrepair, but has recently been refurbished into a pleasant tourist ride. On the way to the train station Ivan pointed out the Titan Crane in Lake Gatun, one of the largest mechanical cranes in the world. We boarded the train hot and tired, but immediately felt refreshed by the air conditioning and soft classical music. The Nutcrackers Suite, one of my favorites, played as we rolled along, sipping drinks and watching Gatun Lake out the dome windows for birds. We found a colony of Snail Kites and some Northern Jacanas, but soon gave in to just relaxing. After about an hour we arrived at our station, disembarked noting another Tropical Mocker on the station roof, snagged a few Panama Railroad souvenirs and drove back to Gamboa Resort, welcome showers and dinner. After dinner some of us went spotlighting for Capybara, but only found Central American Agoutis running around between the buildings. Our wildlife tally for the day was impressive: four kinds of monkeys, both sloths, the Tamandua, dead Possum, Agoutis and about 70 bird species. Our last official tour day began at 0-dark-thirty when we loaded into the van for our final birding adventures with Ivan. First we went to check ponds and a riparian zone at an area called the Ammo Dump where we found a close-up Rufescent Tiger-Heron walking around on the road, waterbirds like Wattled Jacanas (immatures and adults), Green Heron, a Limpkin unusually in a tree, Ringed Kingfisher, and a Baselisk Iguana, and watched miscellaneous other birds like a calling Barred Antshrike, Piratic and Rusty-Margined flycatchers, Common Tody-Flycatcher, Pale-vented Pigeons, Orange-chinned Parakeet, Clay-colored Thrush, Buff-breasted Wren, Snail Kite, Yellow-headed Caracara, Keel-billed Toucan and a Violaceous Trogon with its yellow eyering. Next we stopped at another pond, hearing chatter and trying to see White-breasted Crakes come out of the weeds. Although we saw Black-striped Sparrow, Variable Seed-eater, Buff-breasted Saltator, Southern Rough-winged Swallows, Social and Panama flycatchers, Tropical Kingbird and watched a Tiger-Heron eating snails, the Crakes just would not show themselves. Perhaps we lingered too long with them, because we didnt arrive at Pipeline Road until almost 9:00 am. One of Panamas most legendary birding hotspots, Sendero Oleoducto goes through the heart of Soberania NP which boasts checklists of 525 birds and 105 mammals. An Audubon Society Christmas Bird Count in the 1990s allegedly produced 385 bird species on Pipeline Road in 24 hours. More than half of Panamas birds are possible right here, most likely eastern Panama foothill species and those preferring humid, tropical moist forests! So, even if we were late and lighting was harsh, there was alot to see and hear. Pipeline Road, which we traversed on foot, starts out in scrubby mature secondary tropical moist forest with patches of primary forest, eventually going into primary forest in 3.6 miles. As we walked, various critters caught our attention: Blue Morphos flew past, Bullet Ants, Red-tailed and Variegated squirrels, snapping Golden-collared Manakins, a secretive Rosy Thrush-Tanager foraging on the ground in the brush, Fasciated Antshrike, (H) Slaty-tailed Trogon, Chestnut-sided, (H) Mourning, Golden-winged, Tennessee and Kentucky warblers, Black-bellied Wren, Purple-throated Fruitcrow, a female Red-capped Manakin, Scarlet-rumped Caciques flying over, calling, Blue Dacnis, Crimson-backed, White-shouldered, Palm and Plain-colored tanagers, Red-throated Ant-Tanager, Crested Oropendula, Grey-breasted Martins, Streaked Flycatcher and Crimson-crested Woodpecker. Finally, on our way back we watched a fascinating Tamandua digging termites from a snag. This legendary place deserves to be visited multiple times using different birding strategies. Tearing ourselves away from Pipeline Road we headed to Summit Zoo to visit the impressive Harpy Eagle Exhibit. Displays inside the building are educational and interesting, but not nearly as fascinating as the live birds in a large enclosure outside. A 44-year-old female Aguila arpia and an 8-year-old captive-born male from the Peregrine Funds captive breeding program captivated us for as long as Ivan would let us look. The hope is that these two will mate and produce viable offspring for eventual release into the wild. To date 15 birds have been released into the Canal Zone. The rest of the zoo seemed interesting, especially the big cats and brand new world class Bairds Tapir Exhibit that was to open in April 2004 (after our visit), and birding the grounds would be productive for other birds besides Streaked-headed Woodcreeper, but it was time to move on to our lunch stop at Summit Ponds. Besides birds, Summit Ponds were full of reptiles: a small caiman, a mega American Crocodile and turtles. Birds included Boat-billed Herons that refused to look at us, Black-striped Sparrow, Prothonotary Warbler, Mangrove Swallows perching on sticks, Green and Pygmy kingfishers, Greater Ani, Tropical Gnatcatcher and a Lesser Kiskadee (South American), smaller and with a different voice than Great Kiskadee. Returning to Gamboa Resort in mid-afternoon, we couldnt help birding behind our villas, finding more interesting birds: Green and Red-legged honeycreepers, black mystery swifts with short tails, Yellow-green Vireo, House Wren, Variable Seedeater, a Coati, and our last trip bird, a Rufous-capped Warbler. Inside, we had a party. We went over our daily bird and wildlife sightings with Ivan for the final time, taking time to recount our favorite adventures, and bid Ivan farewell. That evening we enjoyed one last group dinner, recounting more adventures. Some of us were leaving Panama the next morning and the rest transferring back to PTY and the Executivo in the afternoon, which made time to explore the amusement park and bird by mt. bike. We liked riding around instead of walking because it gave us a quicker overview of what we wanted to investigate. We found the replica Embará village empty, but on our way back the ladies were putting out their crafts for the day. They liked our remnant tattoos. Among other things, we bought more cocobolo carvings and a painted tagua nut carving that looks just like pet turtles we had as kids. In the resort lobby we noticed a rather interesting photo of all of the Right Stuff Astronauts who had trained in nearby jungles, and a letter to the Gamboa Resort from the Director of the Tropical Survival School, signed by all of them June 19, 1963. He wrote "All of the signers of this letter who walked on the moon walked here first." Back at the Executivo, we went birding one last time in the backyard and enjoyed a "Bird Test". It was amazing how many new birds we now recognized by sight and ear. All photos / jpegs by David Faike. Ace of Spades card from the Famous Birds of Prey Playing Cards by Heritage Playing Card Company. Many thanks to Marco Gandasegui at Ancon Expeditions for helping to arrange such a great trip and making sure it ran smoothly. This Trip Report is dedicated to Ruth Faike who wouldve said it was way too long, if not ridiculously comprehensive.